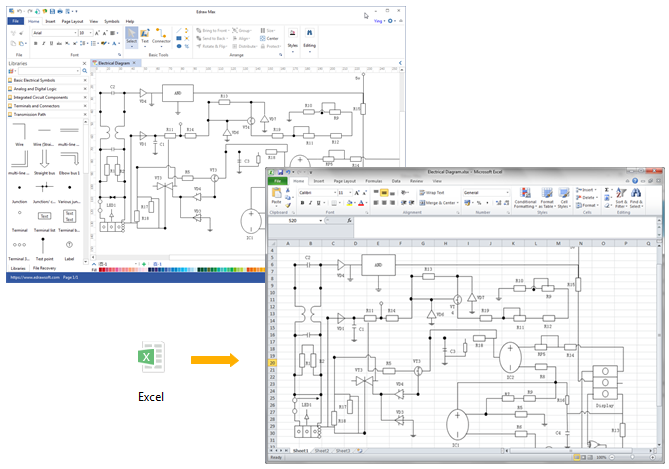 Use an awesome method to create circuit diagram for Excel. With pre-defined electrical symbols, Edraw allows you to create any circuit diagram and export to Excel document on Mac, Windows and Linux systems. Create professional circuit diagrams and schematics with high quality symbols and easy-to-use tools, and help you present your electrical schematic, circuit and logic diagrams and blue prints in minutes. When finish, you can one click export the diagram to Excel format. Our program works fine on Windows, Mac OS X and Linux systems. Circuit diagram makes it easy for technicians to understand how a circuit works. It uses simplified conventional symbols to show all of the components of an electronic circuit and the connections between them. Arrangement of the components interconnections on the diagram does not correspond to their physical locations in the finished device. Edraw is an all-in-one diagram software with many drawing types. so first you need to get into the circuit diagram drawing page. It's located under the Engineering category. From the symbol library on the left of the drawing canvas, drag and drop electrical symbols, such as switches, relays, semi-conductors, etc. From the Transmission Path library, choose suitable transmission path to connect the symbols. Add callouts from the Callout shapes in the General category. Add a background from the Background library in the General category. Add a title from the Title library in the General category. The symbols could be edited through changing the line and fill color. One last step is to export the diagram to Excel format. On the File tab, click Export and Send button. You will see lots of export options. Choose Office -> Excel to convert your file to XLSX format. The program supports Excel 2007, 2010 and 2013 versions. 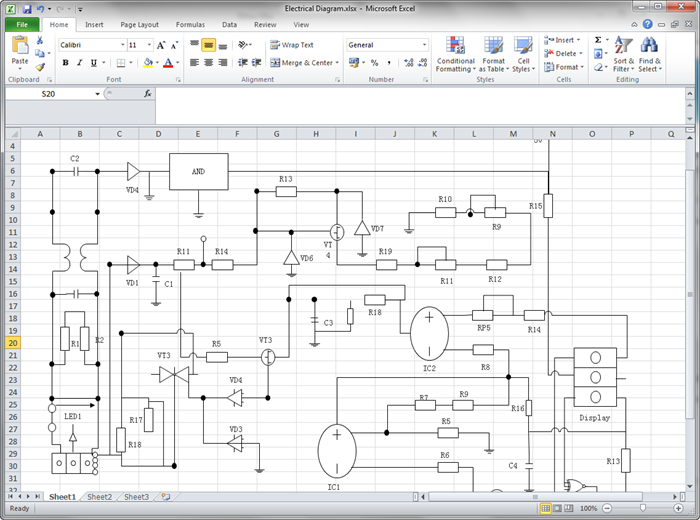 The exported circuit diagram can still be edited in the MS Excel. You are allowed to change the symbol format, edit text and apply quick styles in the Excel document.